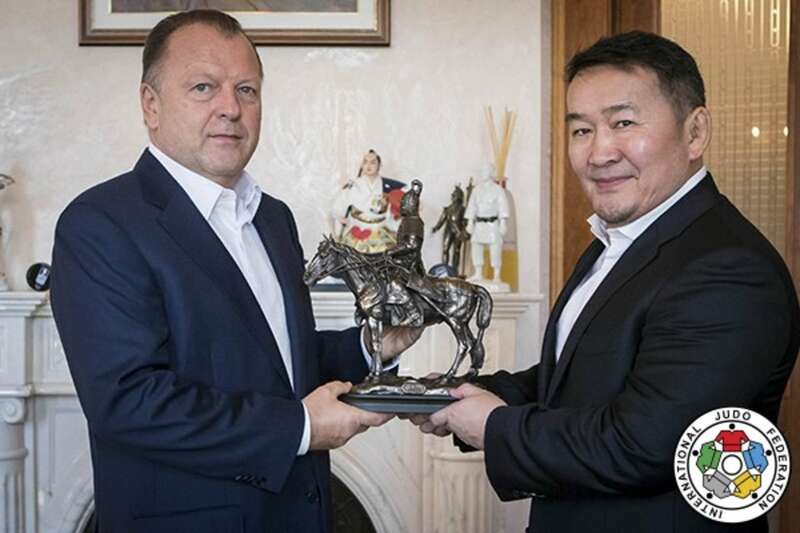 The 2017 Suzuki World Judo Championships saw Mongolia break Japan’s strangehold over the gold medals on Wednesday as Rio 2016 Olympic silver medallist DORJSUREN Sumiya became their country’s second female world champion in the history of Mongolia and first non-Japanese winner here in Budapest, in front of the President of Mongolia, H.E BATTULGA Khaltmaa. 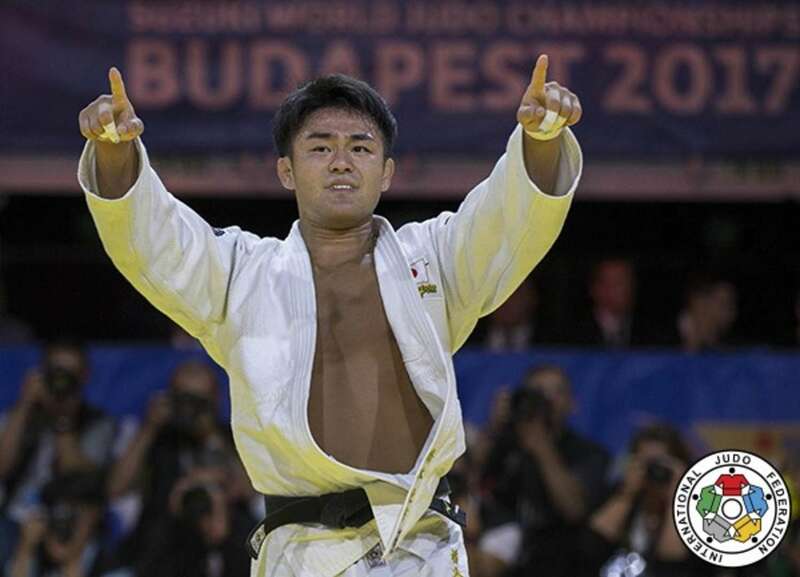 After an epic World Championships final between DORJSUREN and world number one YOSHIDA Tsukasa (JPN) it was the Mongolian who won on the IJF’s biggest stage after a 15-minute duel for gold which teased, tantalised and elated the crowd all at the same time. The President of Mongolia, H.E. 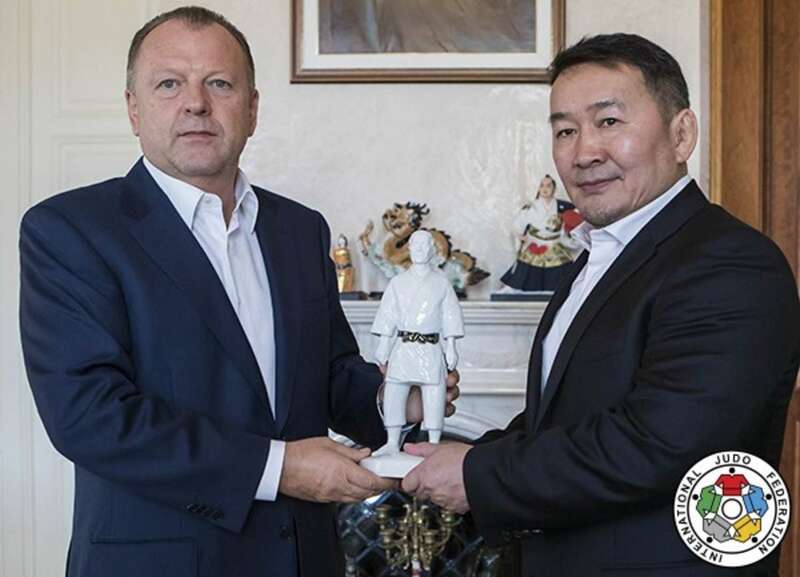 BATTULGA Khaltmaa, who is also President of the Mongolian Judo Association, has often worked out with his country’s national team at their training centre in Ulaanbaatar and was on the edge of his seat for the duration of the contest. H.E. BATTULGA Khaltmaa watched the final from his matside position only metres away from the action and was swiftly congratulated by all those around him as the crowd was awash with Mongolian flags and supporters who sang the loudest anthem of the competition so far. H.E. 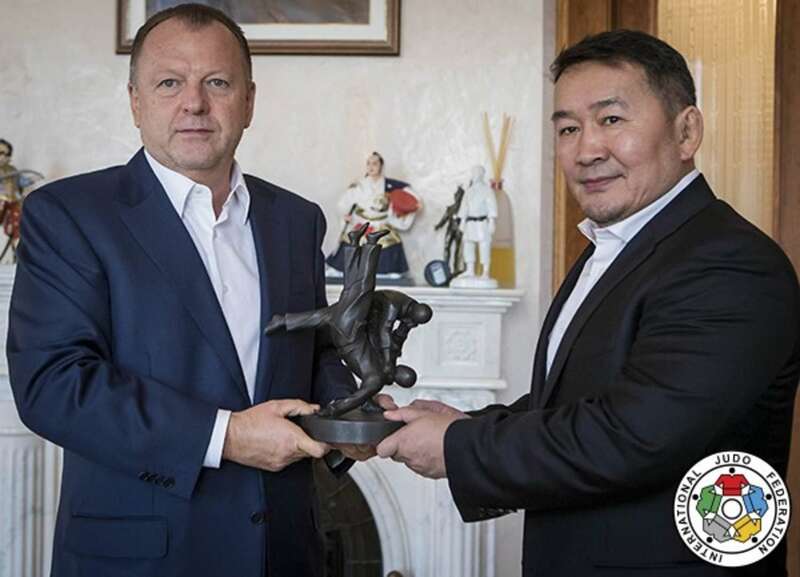 BATTULGA Khaltmaa said: “The gold medal is very important. We are here to get the gold medal. We were planning on getting the gold medal in -48kg category but we could only get the silver. The IJF’s new-look website has now integrated live streaming for all IJF events with a new live section which includes a host of new featured and for the first time there is a separate commentary for each match with world champions and IJF broadcasters calling the action. Double Olympic silver medallist and IJF Hall of Famer Neil ADAMS (below - centre), fellow former world champion Loretta CUSACK-DOYLE (below - right) and veteran IJF commentator Sheldon FRANCO-ROOKS (below - left) commentated on mat each as fans could listen in to IJF experts on all three mats. 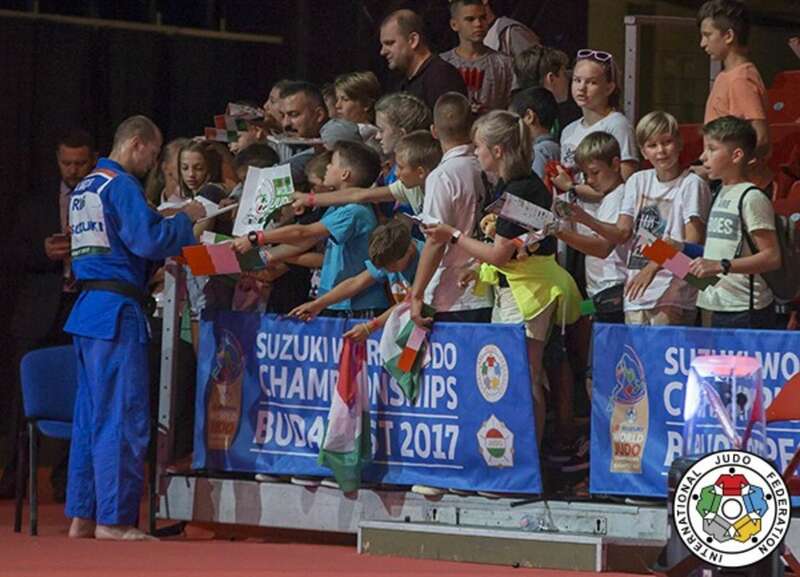 Sheldon FRANCO-ROOKS, who was one of the founding members of live streaming on the international circuit back in 2007 in Budapest, is not surprised by the evolution of judo’s coverage. “When I look back I envisaged at that time the possibility that this could happen,” said FRANCO-ROOKS. On Thursday, the attention of the world will turn to the middleweights with the women’s -63kg and men’s -81kg categories. Olympic and reigning world champion Tina TRSTENJAK (SLO) will be on -63kg duty while -81kg Olympic champion Khasan KHALMURZAEV (RUS) will also wear gold in Budapest as he aims to win his first World Championships honours. Rio 2016 Olympic silver medallist and world number one DORJSUREN Sumiya (MGL) dented Japan’s gold medal and won World Championships gold for Mongolia after a classic final against world number one YOSHIDA Tsukasa (JPN). Japan were four from four, untouched and unstoppable, until the -57kg final and DORJSUREN imposed herself against Worlds debutant YOSHIDA. 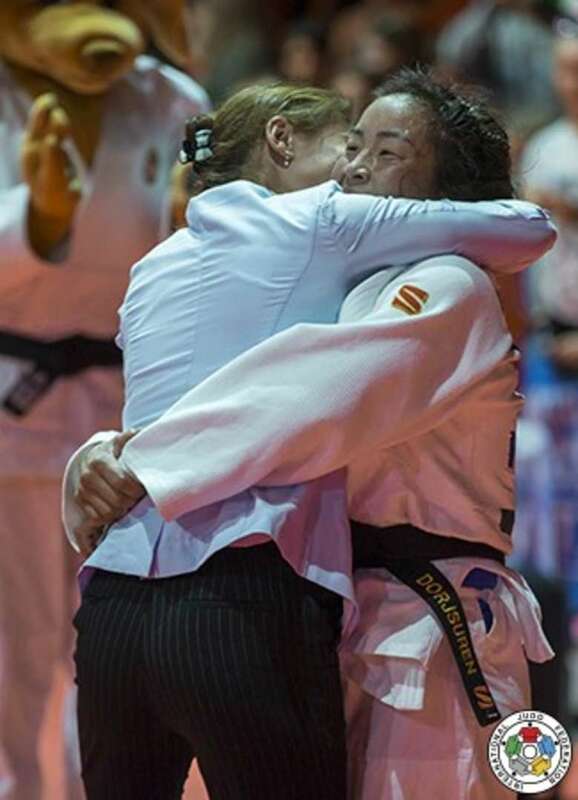 While the gold backpatch eluded the Mongolian in Rio, as she finished with silver, there was no denying her in Budapest as she secured the IJF Worlds Judo Tour’s top prize and a red backpatch until at least the 2018 World Judo Championships in Baku, Azerbaijan. After a scoreless opening four minutes, the seconds and minutes elapsed as both judoka were unrelenting in their bid for gold on day three in Hungary. At the six minute mark of golden score, the crowd were out of their seats clapping trying to energise both judoka and they didn’t want the all-action final to end. DORJSUREN was manoeuvring for an opening and after nine minutes of golden score she threw YOSHIDA with a koshi-guruma for a waza-ari which was worth world gold. DORJSUREN reacted by throwing her hands up in the air before tapping the Mongolian flag on her judogi to show the world where she comes from and where the world title was going to. 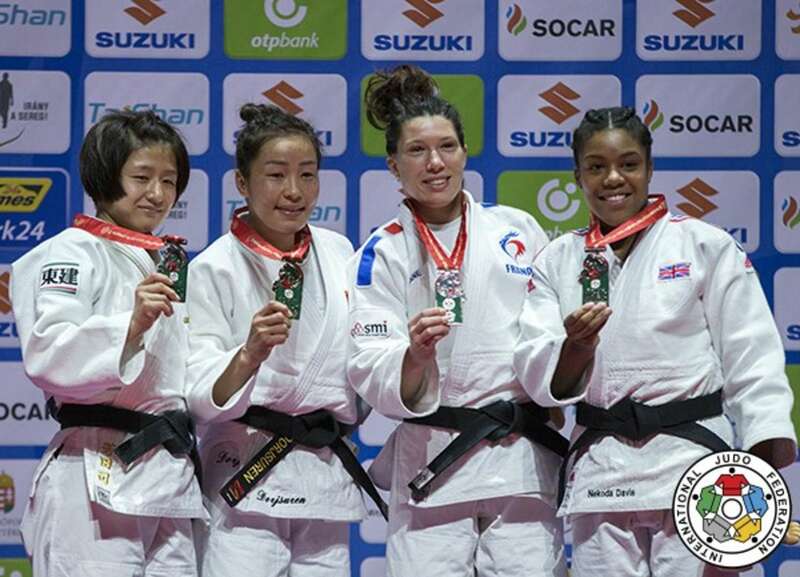 In the first semi-final DORJSUREN defeated Ekaterinburg Grand Slam winner Miryam ROPER (PAN) by ippon with a drop seoi-nage to keep her gold medal tilt on track while Panama could still retain hopes of a medal as she would battle for bronze. In the second semi-final YOSHIDA, winner of three Grand Slam gold medals in a row last year, held down Paris Grand Slam silver medallist Helene RECEVEAUX (FRA) to move into the gold medal contest as Japan looked poised to maintain their golden whitewash. In the first bronze medal contest RECEVEAUX won her first World Championships medal with a narrow victory over four-time world silver medallist Telma MONTEIRO (POR). The Frenchwoman ended her country’s wait for a medal as she countered a failed tomoe-nage attempt from MONTEIRO with a clinical piece of ashi-waza as the Portuguese was caught off guard by a pinpoint de-ashi barai for a waza-ari score. RECEVEAUX was calm and collected and saw out the remaining minute to win their first meeting and seal the best result of her career. In the second bronze medal contest two-time Grand Slam silver medallist Nekoda SMYTHE-DAVIS (GBR) prevailed as ROPER picked up an injury during the contest and could not continue. Briton SMYTHE-DAVIS, 24, from Ealing Judo Club in London, was fighting for the first time at her natural weight of -57kg since the Olympics after a series of niggling injuries but was able to score two waza-ari against ROPER without reply. Panama judoka ROPER, who was supported to take part in Budapest by the IJF, did not suffer any serious injuries and was already back at her hotel by early evening. World number one HASHIMOTO Soichi (JPN) recorded the most famous win of his flourishing career with a hard-fought golden score triumph over Rio 2016 Olympic silver medallist Rustam ORUJOV (AZE). ORUJOV has now lost to major finals in a row to Japanese opposition, which is no slight on him, but means that the sport’s founding nation now boasts the Olympic champion at -73kg in ONO Shohei and the world champion with both the red and gold backpatches belonging to the same country but two different athletes for the first time. The 25-year-old is still undefeated since 2015 and extended his winning streak to 31 consecutive contests. Nicknamed the Ippon Hunter, the charismatic HASHIMOTO was having trouble with the controlling grip of ORUJOV and a nagging knee injury but still, in typical Japanese fashion, found a way to win. A seoi-nage from the Japanese produced a decisive waza-ari score after two minutes of golden score. In the first semi-final HASHIMOTO halted the progress of boy wonder Hidayat HEYDAROV (AZE) by ippon with a trademark sode-tsurikomi-goshi. In the second semi-final former Junior world champion AN Changrim (KOR) lost out to ORUJOV who scored ippon with a harai-makikomi and could not hide his delight as he ran to all four corners of the tatami. 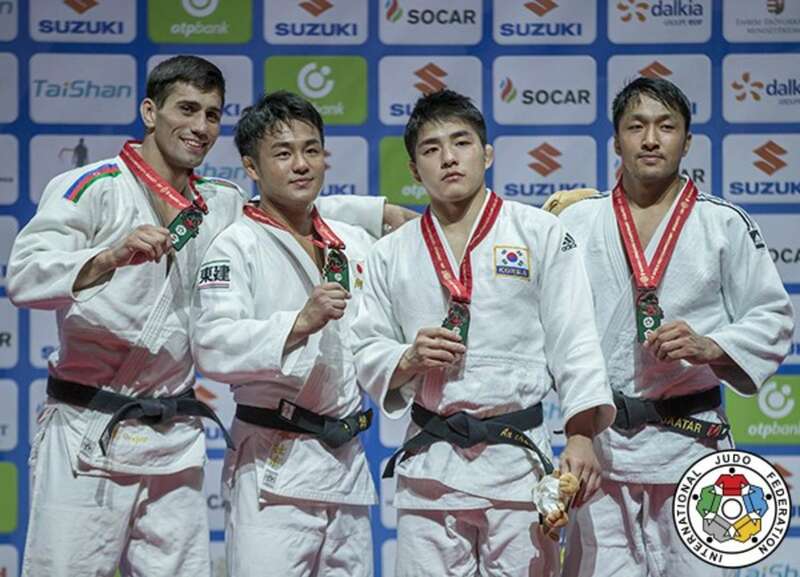 AN had led by a waza-ari from an ashi-waza attack but ORUJOV responded in style to guarantee his first Worlds medal. In the first bronze medal contest AN bested London 2012 Olympic champion and Rio 2016 Olympic bronze medallist Lasha SHAVDATUASHVILI (GEO). Both judoka had registered a waza-ari on the scoreboard and golden score was brought to an end when the former threw for his second waza-ari score with an ashi-waza opening into pure te-waza conclusion to earn his second world bronze. In the second bronze medal contest there was more joy for Mongolia as GANBAATAR Odbayar, who showed off his ippon judo in the preliminaries, defeated 20-year-old Azeri HEYDAROV with a drop seoi-nage for a waza-ari score. The win was a Worlds breakthrough for GANBAATAR and the timing could not have been better as he helped to send his country up to second place in the medal table. HEYDAROV, Hidayat (AZE) vs HASHIMOTO, Soichi (JPN).